It's the end of September! I don't know if it's just me or not, but this year feels like it has flown by! I started this series, keeping up with my successes, last month and plan to do a post at the end of every month going forward. I like to look at a whole month because it's easier to see success that way then looking at it day to day or even week to week. I feel awesome about this month. My gym took on Clean 14 (read about it here and here). We started the diet September 6 and finished on September 19. Aaron lost 11 pounds and I lost 7.6 pounds. We were extremely happy with the results, but didn't want to continue depriving ourselves of everything, so we stopped at two weeks (some people did the Whole 30). We did continue to incorporate much of what we learned, though. It was a really good exercise for us and showed us just how much diet really does factor in to your weight loss! It's crazy how much it changed my eating habits! At the end of last month, my resting heart rate was at 62. It's been down in the high 50s for the past few weeks. This week, it's been around 57-58. It's awesome to see it continue to drop. I'm still working on endurance. Aaron hurt his knee this month, so we haven't been running as much. I'd love to know if I can get to a full two miles yet! I am up to two two-class days a week! I've been doing two classes on Saturdays (barre and spin) and added another two-class day to Tuesday/Thursday (whichever works with my schedule). I'm now doing spin and TRX, which is a suspension system that uses your own body weight. It's a game changer for me because it works different muscles than usual. After the first class, I could barely raise my arms over my head! After the second, I could barely move, period. But I love it. I think I'm just a glutton for punishment now. Oh, you know. No big deal. I'm just down a size. A whole size. Back into a 12. I even wore a super form-fitting dress to our friends' wedding and didn't feel self-conscious. It's awesome. Yet, also not because half of my clothes don't fit. And we've had to increase the laundry loads because I'm pretty much washing and drying things right after I wear them to keep them from falling off. But it's a noticeable difference and I'm getting comments from people all the time, completely unsolicited. Poor Aaron, I'm probably a little hard to put up with right now. Ha. You might get tired of seeing photos, but this is my blog so I post what I want. Plus, I've worked like a mad woman for this. 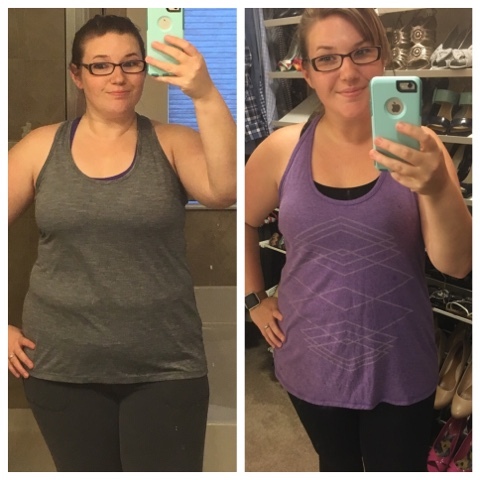 I feel like I've lost weight and I can see it in how my clothes fit (or don't fit), but you really don't grasp the change until you look at photos side by side. It's honestly still kind of crazy to me. Yet really, really awesome. I think the face change is still the craziest. My usual progress pic - January and end of September. Face change like whoa. Left is from my friend Sarah's baby shower and right is from our friends' wedding this past weekend. I really, really wish I had measured myself in the beginning. I think those numbers would have been even crazier than the photos, but oh well. I updated my measurements at the end of Clean 14. I measured again Thursday night. I've had a little more change, but not huge. In the past month, I have lost 0.5" on my arms, 2" on my waist, 1.25" on my hips and 1" on my thighs. I'm pretty darn excited about those numbers. That's in one month. Diet. It really is mostly diet. And a killer workout. Doing Clean 14 really taught me just how much of a role diet plays in trying to lose weight. 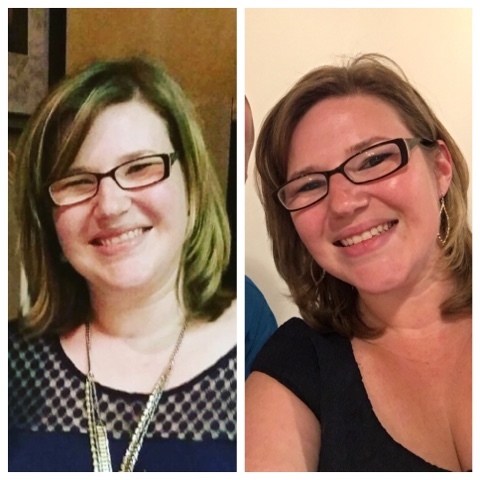 Before this month, I'd lost a total of 10.2 pounds over eight months. I lost 7.6 pounds doing Clean 14 and, miraculously, I haven't gained any back! I'm super proud of being able to maintain the weight loss so far. Overall, I've now lost a total of 17.8 pounds and I think the change is officially noticeably different. It's nice for it to finally start making a difference! I feel awesome. I'm so proud of where I've come, what I can do and even when I have a really ugly workout (like m'bala on Wednesday night when I couldn't balance to save my life), I'm still proud of myself for going. I probably have about 10 times the confidence I had earlier in the year. I have a long way to go to hit my goals, but right now, I just feel good. I haven't felt this way in a really long time. And it's not even about my weight anymore. I mean, it's there because who wants their BMI to tell you that you're obese? But at the same time, it's about not being the last one in the door when we run laps, being able to do two more burpees than I did in the last class, holding half chatturanga and not have to go down to my knees. So while there is a numeric goal, those are the ones I focus on. September was a really awesome month for me. I picked up a new class, learned how to eat better and found sustainable substitutions. Who knew I would actually like almond milk? And that there is bottled pre-mixed lattes with almond milk? Jesus loves me for that to exist. I feel like I've finally hit my stride with this journey. I know that I won't continue to have those awesome results every month because I'm not going to be as strict as I was on Clean 14, but man it's a good ego boost. For October, my goal is to do more Paleo/Primal lifestyle, keep up my exercise schedule and not eat all pumpkin, all day, every day. What about you? How's your journey? How are you keeping up with your success?